Tyler and Kaylin placed third and second, respectively, in their divisions, at the Festivus Competition at Port CrossFit on Saturday. Festivus is a competition specifically designed for the novice and intermediate athlete. Tyler, 13, competed against athletes as old as 18. Tyler is the youngest “Spartan” to represent CrossFit Suffolk at a competition held outside of our gym and he did so admirably! 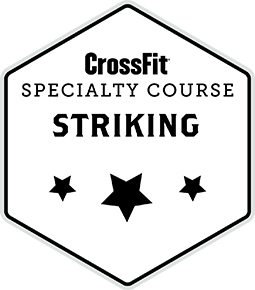 Kaylin is the first of our athletes to compete with less than a year’s experience crossfitting! This took tremendous courage on both their part. We are very proud of them! Congratulations Tyler and Kaylin! Honorable mention goes to Jason C., Tyler’s father, who, despite having injuries, competed as well. Jason and Tyler are the first Father-Son combination to compete at the same competition as representatives of CrossFit Suffolk! EAT PASTA WITHOUT GETTING FAT This might be the best health news item I’ve read in years! Work up to a heavy Floor Press then 3X5 with 70% of your heaviest. NOTE: Partner up and spot each other. If you watch the video, highlighted above, you’ll see that 45# plates are used to provide a platform for the barbell, which is fine, but you can lower the J-Cups on the squat racks and use those to hold the barbell in the proper position. Congratulations Kaylin, Tyler and Jason!! Very Nice! Congratulations Kaylin & Tyler!! I give you a lot of credit giving it a go Jason. Awesome job Kaylin, Jason and Tyler ! Thanks everyone!! 🙂 it was quite the experience but I’m glad I did it!